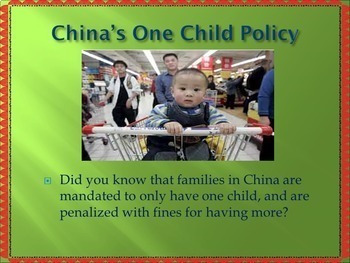 All About China PowerPoint. 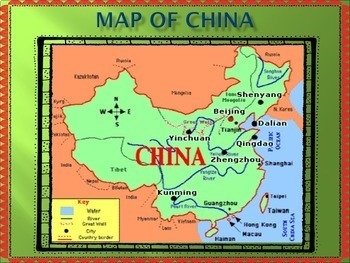 62 slides packed with information on the country of China: the land, the people, the history and the culture. 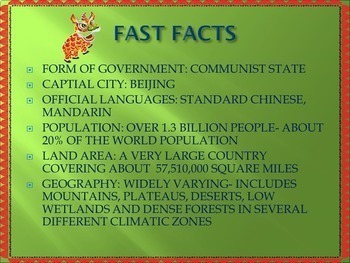 Complete with animation, interesting facts and lots of photographs of different regions of China, this presentation is a good way to supplement a unit of study with an overview of Chinese population, politics, manufacturing, products, agriculture, wildlife, religion, and landmarks. For example, the one-child policy, Chairman Mao, Three Gorges Dam, and educational system are some of the topics covered. 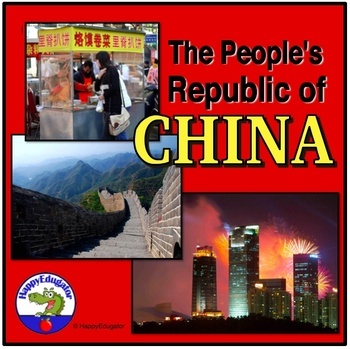 This can also be used in Language Arts class to build background knowledge of China for the novel The Red Scarf Girl.